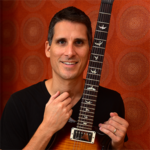 In Chapter 6 of Fretboard Theory Volume II I showed you how to narrowed your focus down from pentatonic scales that cover the complete neck to smaller sections like the lead patterns and riff boxes that many players commonly use. In Fretboard Theory Volume II Chapter 7 I will show you how to use these same patterns for major scales, minor scales, and modes. I will also cover a little theory on how the pentatonic scale relates to these other scales. 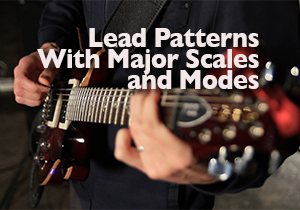 But first, let’s figure out which pentatonic scales will work with what major scales and modes. We can clearly see from the the previous scale list that it is actually the C major pentatonic scale that is common to all three major modes, something that we will take advantage of in Chapter 7. The same property can be seen when we compare the minor pentatonic scale to the different minor modes. To learn more about music, including scales, chords, progressions, modes and more, see the Fretboard Theory page.